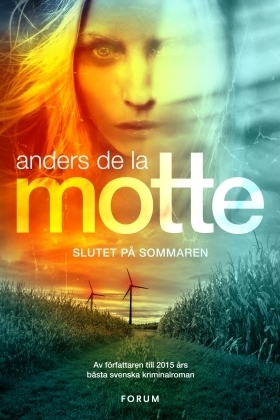 Slutet på Sommaren är en alldeles fantastisk bok! Jag måste erkänna att jag föll totalt för omslaget första gången jag såg boken och handlingsbeskrivningen gjorde mig verkligen sugen att läsa boken. I boken får vi får följa båda polisarbetet 1983 när Billy försvinner samt Billy's storasyster Veronicas egna sökande över svar tjugo år senare när hon under ett gruppterapisamtal träffar på en ung man som skulle kunna vara en kopia av Billy som stor. Veronica har aldrig riktigt kommit över sin brors försvinnande och händelsen kom att splittra hennes familj och att återvända hem för att söka efter svar blir tufft för henne. Speciellt då det känns som om det finns de som inte vill att hon ska finna ut sanningen. För mig är Slutet på Sommaren en av de bästa böcker jag har läst i år. Den är oerhört gripande och spännande att läsa. A five-year-old boy from a remote farm on the plains of Skåne disappear late one summer evening in 1983. The only trail after him is a shoe in the tall corn fields. Although the whole neighborhood gets involved in the search do they not find him, and rumors and suspicions spread quickly. And, the clumsy criminal investigation is, in the end, closed down when they can't find the boy, and the grief and uncertainty get the boy's family to slowly fall apart. Twenty years later, is his sister Veronica leading group psychotherapy talks in Stockholm. Suddenly a young man joins the group, and he talks about his childhood, about the inexplicable memories of a boy's disappearance. His story is frighteningly familiar and it shakes Veronica. Reluctantly, she is forced to risk the fragile life she built up. She must return to Skåne and her broken family to seek the answer to the question no longer want to ask. What really happened that summer so long ago? The summer that never ended. The End of the Summer is a fantastic book. I have to admit that I completely fell for the gorgeous cover the first time I saw the book and the description made me really eager to read the book. In the book, we get to follow both the police work back in 1983 when Billy disappeared and we also get to follow Veronica 20 years later as she starts her own search for the truth when during a psychotherapy meeting she meets a young man that could be a copy of Billy as an adult. Veronica has never really gotten over her brother's disappearing and the event leads to the breakup of her family. To return home and to search for the truth is hard for her. Especially since it seems that there are those that don't want her to find out the truth. The End of the Summer is one of the best books I have read this year. It's gripping and very thrilling to read! Thanks to Forum bokförlag for the review copy!